Threaded through the 22 months of the program, the Personal and Professional Effectiveness (PPE) curriculum dives into the hidden world that separates good from great. Focused broadly on skills related to leadership development and career management, these courses are accompanied by opportunities for individual coaching to support each student’s efforts to set and achieve professional development goals. PPE modules are intended to offer students a blend of new knowledge acquisition, time to practice and hone skills through in-class workshops, out-of-class reflection, opportunities to engage with industry-relevant guest speakers and peer-to-peer discussion, which provides the class with the chance to leverage knowledge gained through previous work and life experiences. During your corporate residency PPE continues to be a resource for you. Faculty members are available for individual coaching or consultation. In addition, experiential learning opportunities via action learning assignments and a corporate residency debrief highlight the ongoing skill development that occurs over the course of the 8 months. 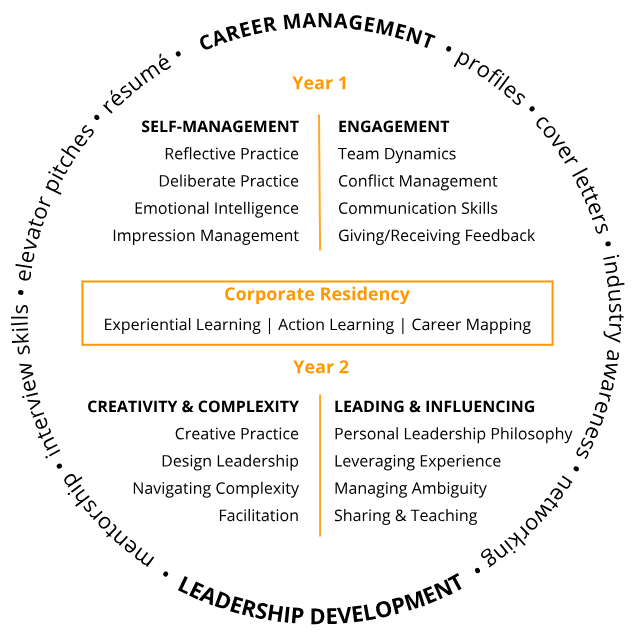 Upon returning from your corporate residency the final two PPE modules are focused topics and skills intended to support your post-grad job search and your longer term career management efforts. Fostering creativity, navigating complexity, identifying innovative opportunities and clarifying your individual approaches to leadership and influence are at the core of second-year PPE. Our PPE curriculum is delivered by our Management Career Services team and multiple faculty members from the Rowe School of Business. We also consult with industry partners to ensure our course material is timely and relevant for young professionals.